It looks pretty great and is only $37 for "lifetime" access. This is a great idea if you bought the coffee table and probably an even better idea if you did not. I would like a download or even a physical copy of the content, but I already have a physical copy of the book. Yes, got the B5 at 20 book too. A bit annoyed that if you buy this for $37 it gives you access to the on line encyclopedia from links that a lot of us paid $200 for including the physical copies of the book. 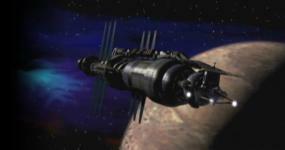 Caption content hyperlinked to the Babylon 5 Encyclopedia (separate membership required).